The Master must consider the effect of any given parcel of DG cargo upon other cargo carried on board, as well as possible effects of the cargo on the structure of his vessel. Clear guidelines apply to the stowage and segregation of Dangerous Goods and in some cases may require particular commodities to be carried in completely separate holds. Clearly, the interaction of two cargoes will not occur if the packaging of that cargo remains intact. However, the Master must always consider the possible effect should the cargo escape for any reason and should not restrict his consideration to those cargoes which are listed in the IMDG Code. An example might be fruit juice concentrates which although having no risk to the ship or personnel, can write off an entire cargo susceptible to taint even if the escape is relatively small. For this reason, when loading cargo particular attention should be paid to damaged packages and any which are not satisfactory should be rejected. 1)	Every dangerous cargo shipment shall be made in line with IMO policy and be accompanied by required documentation. DG cargo with restricted/prohibited UN numbers shall not be accepted for shipment unless under special circumstance express permission is obtained from the company. 2)	All DG containers must be checked for proper label/placard as required by the IMDG code. A stock of spare labels/placards must be kept on board. 3)	DG containers must be checked for condition prior loading and leaking or damaged containers posing a hazard, shall be rejected. 4)	It must be ensured that all DG containers are loaded in the planned stow position. Any discrepancies shall be brought to the notice of the Terminal planner / Central planner and / or local agent as required. The final condition may be accepted only if meeting all stowage and segregation requirements; else it must be corrected by discharging / shifting concerned container(s). 5)	The requisite day/night signals for vessels carrying / loading / discharging dangerous cargo shall be displayed. 6)	When handling/carrying dangerous cargo on board smoking shall strictly not be allowed other than in designated smoking areas. Signs/placards shall be appropriately displayed at gangway and on deck. 7)	Location and properties of dangerous cargo shall be considered when carrying out any special work on board such as hot work etc. Certificate indicating correct loading of a dangerous goods container and the observance of the regulations set out in the IMDG Code (International Maritime Dangerous Goods Code). The container packing certificate is issued by the person responsible for packing the container. 8)	Other precautions shall be taken when handling dangerous cargo shipments as warranted by good seamanship, SOLAS, MARPOL, IMDG code, local and national regulations. 9)	Further guidance for handling D.G cargo is contained in IMDG Code vol 1, 2 & supplement. DG stowage : Particular caution is to be exercised when stowing dangerous cargo on board the vessel. Any dangerous cargo presented for loading must be accompanied by a proper manifest and declaration as required by international regulations . Further this DG cargo must be acceptable for carriage as per IMDG code guidance. Reference here is made to the list of UN numbers restricted/prohibited for carriage on board particular vessels. After confirming acceptability of the DG cargo, the plan must be checked for proper stowage and segregation. Although terminal and central planners should provide proper stow of DG cargo, the final responsibility always lies with the Master. Reference shall be made to vessels Document of Compliance with special requirements for ships carrying dangerous goods for confirming that proposed DG classes are acceptable for stowage in planned locations on board. (e.g. Clear of living quarters OR if under deck, in a mechanically ventilated space etc) may be verified from individual entries of dangerous goods list in the IMDG code. DG segregation shall be verified for compliance with requirements of the IMDG code. Caution must be exercised when using vessels stowage planning software for this purpose as it may or may not have comprehensive means of checking for bad stowage & segregation against the latest international requirements. It is advisable to manually check for compliance. The greatest care should be taken to ensure that incompatible substances are never stowed together in the same compartment or container. The IMDG Code classifies such substances according to the principal hazard, but not all substances of a particular class are necessarily compatible (e.g. Class 8 where a violent reaction may take place between acids and alkalis). Careful consideration should be given to all other commodities (and their packaging) to be stowed with hazardous substances to ensure against dangerous interaction occurring. For instance non-hazardous cargo packed with straw, wood, wool or other combustible materials should not be stowed with Dangerous Goods. Substances which react with water must not be stowed with items having a water base. Foodstuffs must not, as a general rule, be packed with Dangerous Goods. Segregation requirements of the IMDG code and any other local/national regulations must be strictly adhered to. One must be aware that even DG cargoes belonging to the same class may have segregation requirements amongst them. A good example is that of alkalis requiring to be separated form acids where as both acids and alkalis may belong to IMO Class 8. 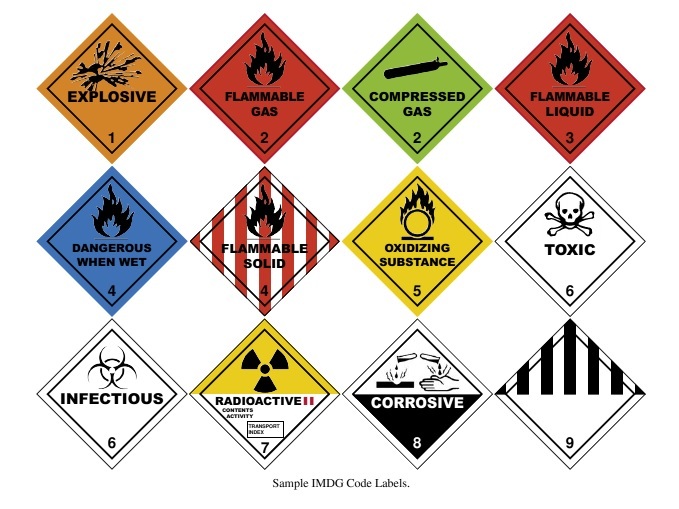 Such segregation requirement will not be found in the segregation tables of the IMDG code and only individual entries of the dangerous goods list in the code indicate the requirement. Dangerous Goods stowed on deck must be properly secured, having regard both to the nature of the packages and the weather conditions liable to be experienced. Adequate security can be obtained by means of temporary structures made by using bulwarks, hatch coamings and bridge bulkhead, the structure being closed by means of portable angles bolted to bulwarks and hatch stiffeners. The cargo so stowed should be further secured by means of overall lashings or nets. Unless so stowed or secured by some equally satisfactory methods bulky packages should be lashed individually, preferably with wire rope. Stowage should be such as to provide safe and satisfactory access to the crew's quarters and all parts of the deck required to be used in the navigation and necessary work of the ship, with sufficient space for the crew to work clear of the goods concerned. Dangerous Goods stowed in wells should not be stowed above the height of the bulwarks, and cargo which, by reason of its nature, is liable to damage hatch covers or their seals should not be stowed on the hatch. Where deck cargo of an inflammable nature is carried, special precautions must be taken to prevent smoking or the use of naked lights in the vicinity of the cargo. Notices should be prominently displayed to that effect. Substances liable to give off inflammable or poisonous vapours should be stowed away from intake ventilators. In ships carrying passengers, Dangerous Goods may not be stowed in any part of the decks available for passengers or near passenger accommodation. In the case of combustibles care must be taken to avoid the risk of ignition which may arise from electrical short circuits or old electric cables. Division 1.1 Substances and articles which have a mass explosion hazard. Division 1.2 Substances and articles which have a projection hazard but not a mass explosion hazard. Division 1.3 Substances and articles which have a fire hazard and either a minor blast hazard or a minor projection hazard or both, but not a mass explosion hazard. Division 1.4 Substances and articles which present no significant hazard. Subdivision 1.4S contains substances and articles so packaged, or designed, that any hazardous effects arising from accidental functioning are confined within the package unless the package has been degraded by fire, in which case all blast or projection effects are limited to the extent that they do not significantly hinder fire-fighting or other emergency response efforts in the immediate vicinity of the package. Division 1.5 Very insensitive substances which have a mass explosion hazard. Division 1.6 Extremely insensitive articles which do not have a mass explosion hazard. Flammable liquids are grouped for packing purposes according to their flashpoint, their boiling point, and their viscosity. Class 4.1 Solids having the properties of being easily ignited by external sources, such as spark and flames, and of being readily combustible, or of being liable to cause or contribute to a fire or cause one through friction. Class 4.2 Solids or liquids possessing the common property of being liable spontaneously to heat and to ignite. Class 4.3 Substances which, in contact with water, emit flammable gases. Class 5.1 Substances which, although themselves are not necessarily combustible, but may, either by yielding oxygen or by similar processes, increase the risk and intensity of fire in other materials which they come into contact with. Class 6.1 Toxic substances liable either to cause death or serious injury or to harm health if swallowed or inhaled, or by skin contact. Substances, which, by chemical action, will cause severe damage, when in contact with living tissue or, in case of leakage, will materially damage, or even destroy, other goods or the means of transport. Many substances are sufficiently volatile to emit vapour irritating to the nose and eyes. Further reading: International Maritime Dangerous Goods Code. How to load maximum number 20 feet container on deck ? What are the extra precaution should be taken prior loading a 45 feet container on deck ?